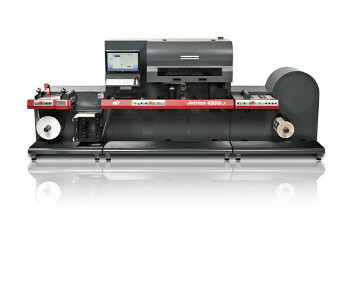 EFI unveils optimised ERP and one-pass LED Inkjet label print, varnish and cut workflow at exhibition. EFI Jetrion 4950LXAt the Labelexpo Americas 2014 (9-11 September; Rosemont, Illinois) EFI™ unveiled the first fully in-line LED inkjet digital printing system with flexo varnish, lamination, in-line laser cutting and slitting for lean label production. The production line features the 13-inch wide EFI Jetrion 4950LX LED narrow web press now available with a new white ink module. The new end-to-end production line makes its debut amid increasing momentum among Jetrion customers: EFI has just surpassed the 200-press milestone for its installed base of Jetrion equipment. EFI's new, complete label converting production line was on display in the company's Labelexpo exhibit, which also featured the EFI H1625 LED printer a new, 65-inch wide hybrid roll/flatbed printer suitable for high-quality label proofing and packaging prototyping applications. EFI, which has seen its sales of advanced packaging MIS/ERP products double over the past two years, is continuing its momentum in software innovation with the launch of the latest version of the EFI Radius ERP system, which offers new scheduling, CRM and order-entry tools for streamlined, automated converting workflows. These industry-leading solutions offer unparalleled plant optimisation opportunities that are critical in today's short-run, digital environment. The automated Jetrion 4950LX press with integrated finishing has a superior, 720x720 dots per inch resolution. Plus, EFI demonstrated a faster, 200 feet (60 metres)per minute speed for the press, a higher level of throughput that can make digital inkjet label converting an even more useful option as a replacement for flexographic printing. "The Jetrion 4950LX press's productivity, quality, and low cost per label combined with the ability to go from blank substrate to finished labels in a single pass will serve as a tipping point for the many flexo converters looking for a way to profitably add digital printing capabilities," said Stephen Emery, vice president of EFI's Jetrion and ink businesses. "This press and our industry-leading Radius workflow exemplify the technical innovations that help so many EFI customers become top performers in the packaging market." "This press and our industry-leading Radius workflow exemplify the technical innovations that help so many EFI customers become top performers in the packaging market." The Jetrion 4950LX LED press which was on display is the culmination of years of advanced research in narrow-web production and LED inkjet technology. Jetrion is considered the market leader in narrow-web inkjet technology and has helped customers worldwide achieve remarkable growth in digital label printing. With nearly 200 Jetrion presses installed worldwide, ink volumes increased 23 per cent in the first half of 2014, a testament to converters' ability to migrate a wide range of jobs to Jetrion presses for more profitable short-run and multi-SKU label production. With the Jetrion 4950LX model, converters can reduce labour costs and make-ready prep using a 1000-watt inline laser cutter. Plus, the new white ink for the press gives converters more flexibility in full-colour imaging on clear, metallic and coloured substrates. The press's LED platform offers a "cool cure" advantage, giving converters the opportunity to print on a broader range of substrates, including flexible packaging films, that cannot withstand the heat required with other curing or drying methods. "Cool cure" printing with the Jetrion 4950LX press also is a greener, more economical choice because it requires significantly less energy, and the press's LED lamps are more consistent and last significantly longer than traditional UV lamps. Label converters looking for ways to improve their management and production workflow were able to view the latest release of EFI Radius ERP software at Labelexpo. Version 15.1 builds on the end-to-end integrated and automated capabilities of the Radius platform, adding the power of PrintFlow Dynamic Scheduling: EFI's award-winning, smart workflow toolkit. Based on the Theory of Global Optimisation (TGO), PrintFlow is the industry's ultimate scheduling platform. TGO is lean re-written and improved for the printing and packaging industry and it is the foundation for synchronising and optimising converters' production operations. PrintFlow creates an optimised schedule for the entire company and each machine based on constraints such as workload, job characteristics, work centre capabilities, and delivery priorities, juggling thousands of pieces of information to build the most efficient production schedule for the plant and maximise profits. The software automatically and intelligently schedules thousands of tasks and sequences them to minimise switchover and setup time. Many customers that use PrintFlow have reported reduced waste, faster internal communications, reduced overtime, and greater productivity without increasing staff size. Other enhancements to the Radius platform include mobility features for sales and management personnel using EFI's award-winning CRM software. Plus, a Radius web portal further simplifies order entry by extending capabilities to the end customer. The streamlined Radius business workflow now extends to shipping and fulfilment with integrated connectivity to EFI SmartLinc multi-carrier shipping software. You can Tweet, Like us on Facebook, Share, Google+, print and email from the top of this article. CRON delivers exceptional image quality yet low cost solutions. Blue Is The Colour For MTEX At Sign & Digital UK! Derprosa Films A Success Again At Luxe Pack. White Toner Magic At Sign & Digital UK.